United Weavers is a leading supplier of rustic and lodge style rugs. They specialize in created breathtaking rugs that are affordable and finely crafted. The company has developed a reputation of trust and respect since its creation in 1997. United Weavers rugs complement any decor. 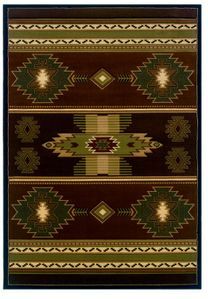 Lodge Craft is proud to offer this fine selection of area rugs and vouches for their quality and beauty. Take a look at our selection and choose the one that suits your lodge furniture and rustic style.